This journal takes an inclusive approach and publishes articles about basic and applied research using quantitative, qualitative and mixed methods; position papers; literature reviews; research reports; briefing papers; book reviews and letters to the editor. IJCYFS seeks to foster and support the dissemination of knowledge about children, youth, families and their communities and the challenges they face. This journal welcomes guest editors and writers who wish to publish special issues that provide in-depth, innovative information about global concerns that impact children and youth, their families and communities. 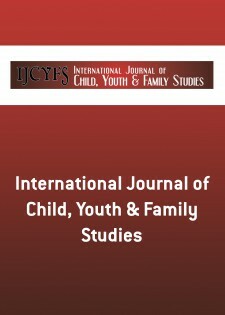 The International Journal of Child, Youth and Family Studies is published under the Open Access model and is therefore free for anybody to read and download, and to copy and disseminate for educational purposes. Articles are posted online immediately as they are ready for publication.